The E-Type sports car. At the tail end of the production of the Series 1, around March 1968, between ten and twenty units had their headlights modified by removing the glass cover, and altering the concave area below which they were positioned. The result of this was to produce a stronger light on these cars that were destined for the UK market. 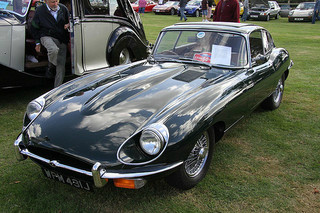 Since this variant was quite unique in terms of the limited numbers of units involved, it was therefore ranked as the rarest of all E-Types. In 1968, the US government introduced new legislation relating to impact during a crash, and the control of exhaust emissions. 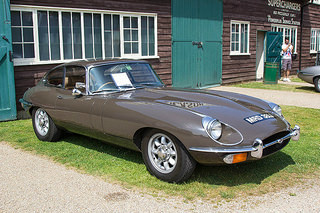 Since this affected all three E-Type variants, the company decided to phase the changes in gradually, starting near the end of production of the Series 1 sports car. The first change involved removing the sloping glass covers over the headlights to prevent breakage upon impact. This was then to be followed by detuning the engine, which involved replacing the three SU HD8 carburettors with an alternative intake manifold linked to two Stromberg CD2SE carburettors. This "federalised" engine could now be recognised by not only the use of the Stromberg carburettors, but also the addition of a new camshaft cover. Some of these transition units also featured two cooling fans, and fitting seats with adjustable backs. Another aspect of the US safety law was that winged knockoff spinners had to be replaced by a hexagonal nut, which was hammered on and off by means of a special tool supplied with the car. However, regardless of these changes, the body styling of the Series 1.5 sports car remained unchanged from that of the Series 1. Internally, rocker switches took the place of the original toggle version, and a collapsible steering column was fitted. Furthermore, the very distinctive starter button on the dashboard was replaced by a standard key start. This transition period extended from late 1967 to 1968, when the Series 1 was phased out. 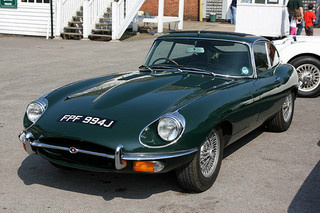 In October 1968, the Series 1 E-Type Jaguar sports car was replaced by the Series 2, which was powered by the 6-cylinder, 4.2 litre XK engine, first introduced in 1964. The federalised engine, with two Stromberg carburettors and larger valve clearances, was still used in US exports but, for the UK market, the original format of three SU carburettors, with narrower valve clearances, was retained. The headlights underwent additional changes, which involved them being moved further forward, and having the aperture of the light increased, which was highlighted by the distinctive chrome surrounds. The polished camshaft covers now received a less attractive ribbed appearance. Larger versions of the front indicators and rear lights were introduced, and fitted further down from the bumpers. There was a restyled bonnet which incorporated an air intake aperture that had been increased to improve cooling. In terms of the 2+2 variant, the windscreen was re-positioned several inches further forward so that it appeared not as upright as in the Series 1 car. Prior to 1968, non-continuous bumpers were fitted both front and rear, but these were now replaced by a heavier, continuous bumper at the front, and a wrap around version at the rear. Internally, the dashboard was redesigned, reclining seats were now added, whist door handles were recessed as an additional safety measure. Wire wheels were still standard equipment, and the brakes were updated. The steering column, which was now collapsible, contained both a steering lock and ignition key unit which replaced the original ignition switch and starter button positioned in the dashboard. Optional extras included air conditioning, power steering, and steel wheels with complete covers. In terms of sales of these Jaguar cars, since the convertible was by far the more popular, then an example in good condition could command between $50,000 and $70,000, whist one in showroom condition could reach as much as $140,000. Amongst Jaguar cars, the E-Type will always be regarded as a show-stopper, regardless of its age. A 1968-71 Jaguar E-Type Series 2 in very good condition would fetch between £45,000/$70,000 and £55,000/$90,000, whilst a superb example would command around £75,000/$120,000. A Series 1.5 example could be valued at £50,000/$78,000.